Does the finding of such moments qualify as a historical view? It is, in the sense that the astronauts are not only experiencing an accumulation of events, but also in that they are performing an act of interpretation. They observe and record the war occurring below, their end result being a collection of human moments. In training their own their own powers of observation on the terrain below, the astronauts acknowledge how the surface of the Earth becomes a repository for all these human moments. The terrain below becomes a site of interpretation and analysis. The idea of moment, taken from the title of DeLillo’s story, gives us some interpretative leverage. We are accustomed of thinking of a moment in temporal terms. A moment can be an event, an occurrence of brief duration. Yet “moment” also has a scientific definition. In physics, then, we use the term “moment” to describe rotational force. A moment is therefore a measure of the force produced by an object at a distance. This is an interesting take on the definition not only because it complicates the title of DeLillo’s short story, but also because it describes the act of narration occurring in the story. The narrators impart their own views (and lasers) onto the surface below – it is then quite possible that the “human moments” talked about in the story are a measure of the force acted upon the surface of the Earth by the astronauts aboard the military spacecraft. But “moment” also suggests circular motion. The moment could very well then describe the force of the orbit around the Earth. Periods. Cycles. Such words describe the passage of time. They are concepts with visual analogs – the circular shapes and logics of orbits, rotations, et cetera. They are constructions in the sense that they demonstrate the assigning of words to natural concepts. Historian of science Peter Galison identifies two types of constructions, each a discontinuity coded to a specific type of practice: “To the historian, the choice of periodization (discontinuity in time) roughly parallels the cartographer’s choice of map type (discontinuity in space).” But there is a way to construct continuity, a way to undo these discontinuities implicit in periodization and cartography, but using these very same processes to arrive at a slightly different understanding of landscape. To put it another way, it is a process not unsimilar to age-old unities of time, action, and place as iterated in Aristotle’s Poetics. Contemporary discourses in the field of landscape often mention the process of “recovering” landscape. This process of recovery usually invokes the restorative potential of criticism and history – a way of reclaiming time and space. In his introduction to Recovering Landscape (1999), James Corner considers this project of reclamation as the gathering of “memories, places, sites, ecologies, and potential futures.” On one hand, It is possible to frame the above-mentioned continuity in terms of restoring time and space. On the other hand, the above concepts – periods, orbits, cycles, rockets, and spacecraft – can yield a different understanding of the landscape below. This understanding, of course, is the point of DeLillo's quote. But turning the camera eye in the opposite direction towards the heavens provides us with a similar experience. 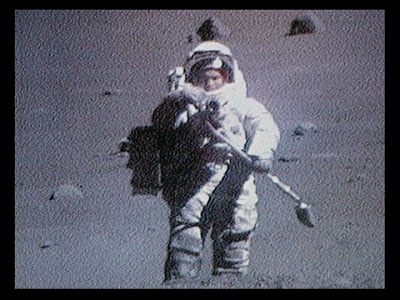 Al Reinert's For All Mankind (1989) features a remarkable assemblage of footage taken by NASA astronauts. The lunar landscape, as one astronaut remarks, is a ashen oasis amidst the most brilliant sunlight and the blackest void of space imaginable. Amidst this far outpost, Reinert presents us with a collection of material artifacts floating and drifting in space and on the moon. Sitting through For All Mankind's 96-minute running time, one will see ... stuff. Capsules crammed with papers, food tubes, cassette players. An astronaut dropping a hammer and feather on the surface of the moon (to prove Galileo's famous theorems). Paint chips flying away from a massive Saturn V rocket hurling into the atmosphere. Panels and bulkheads separating away from the third stage rocket. A singular glove flying away from the cockpit of a Gemini capsule. And finally, an astronaut's face peering through the clear visor of his helmet, his face taking in the rays of the sun without the protection of smoked plexiglass ... a reminder of human moments in outer space. Thank you! I appreciate the kind thoughts.